The Bible is the world's best seller. It is the most widely distributed and read book on this planet. But it is also the most misunderstood and most maligned book ever written. Why? Millions of people believe the Bible is the infallible Word of God; to them, the Scriptures are inerrant. But to others, the Bible is merely a collection of ancient, uninspired writings that may have some historical, poetic and inspirational value. Is this venerable Book, referred to by U.S. President John Adams as "the Volume of Inspiration," really the unquestionable, authoritative Word of the living God? Bruce Barton once wrote a book about the Bible, entitled The Book Nobody Knows. Truly, many of those who believe in the Bible don't really believe it — because they don't believe what it says. The professed agnostic Robert G. Ingersoll (1833-1899) wrote: "The real oppressor, enslaver and corrupter of the people is the Bible. That Book is the chain that binds, the dungeon that holds the clergy. That Book spreads the pall of superstition over the colleges and schools. That Book puts out the eyes of science and makes honest investigation a crime. That Book fills the world with bigotry, hy-pocrisy and fear" (Some Mistakes of Moses). 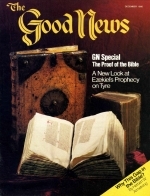 Mr. In-gersoll also asserted: "God made a great number of promises to Abraham, but few of them were ever kept. He agreed to make him the father of a great nation, but He did not. He solemnly promised to give him a great country, including all the land between the river of Egypt and the Euphrates, but He did not.... Their [Israel's] God was quick-tempered, unreasonable, cruel, revengeful and dishonest. He was always promising, but never performed." What about these claims? Many of the world's great men have been readers of the Bible and confessed that some of their beliefs and wisdom came from that Book. President Abraham Lincoln, for instance, often read the Bible and regularly quoted from it. "We reject with scorn all these learned and laboured myths that Moses was but a legendary figure. We believe that the most scientific view, the most up-to-date and rationalistic "conception, will find its fullest satisfaction in taking the Bible story literally.... We may be sure that all these things [mentioned in the Bible] happened just as they are set out according to Holy Writ; we may believe that they happened to people not so very different from ourselves, and that the impressions these people received were faithfully recorded, and have been transmitted across the centuries with far more accuracy than many of the telegraphed accounts we read of the goings-on of today." Mr. Churchill went on to make this challenge: "Let the men of science and of learning expand their knowledge and probe with their researches every detail of the records which have been preserved to us from these dim ages. All they will do is to fortify the grand simplicity and essential accuracy of the recorded truths which have lighted so far the pilgrimage of man" (Thoughts and Adventures). What is the truth? Is there any accuracy in either of these widely divergent views? Now let us look at the Bible, to see what it says about itself. David said, "The words of the Lord are pure words: as silver tried in a furnace of earth, purified seven times" (Ps. 12:6). Jesus Christ gave ample testimony to the authenticity of the Holy Scriptures. He referred to them as being the very Word of God: "And beginning at Moses and all the prophets, he [Christ] expounded unto them in all the scriptures the things concerning himself' (Luke 24:27). "And he said unto them, These are the words which I spake unto you... that all things must be fulfilled, which were written in the law of Moses, and in the prophets, and in the psalms, concerning me. Then opened he their understanding, that they might understand the scriptures" (verses 44-45). The apostle Paul, writing in the middle of the first century, said: "All scripture is given by inspiration of God, and is profitable for doctrine, for reproof, for correction, for instruction in righteousness: That the man of God may be perfect, thoroughly furnished. unto all good works" (II Tim. 3:16-17). Humans visit museums and other repositories of historic documents such as Britain's Magna Carta and America's Declaration of Independence and stand in awe at the sight of those documents. How much more should we stand in awe of the very Word of the living God? Through the prophet Isaiah God revealed that He deliberately inspired the Bible in such a way that it is not easily understood. Isaiah asked: "Whom shall he teach knowledge? and whom shall he make to understand doctrine? ... For precept must be upon precept, precept upon precept; line upon line, line upon line; here a little, and there a little: For with stammering lips and another tongue will he speak to this people" (Isa. 28:9-11). The Word of God is written so that its various pieces must be put together like a picture puzzle. All the scriptures on anyone subject must be viewed together to get the entire picture. But why? Isaiah answers, "That they might go, and fall backward, and be broken, and snared, and taken" (verse 13). When Jesus was asked why He spoke to the multitudes in parables, He said: "Unto you [His disciples] it is given to know the mystery of the kingdom of God: but unto them that are without, all these things are done in parables: That seeing they may see, and not perceive; and hearing they may hear, and not understand; lest at any time they should be converted, and their sins should be forgiven them" (Mark 4:11-12). Few in the world realize that this is not the only day of salvation. It is merely "a day of salvation" (Isa. 49:8). God is not calling the masses today. He is only calling out of this world His Church (the Greek word for "church," ekklesia, means "the called-out ones"). Speaking of true Christians, God says, "For the time is come that judgment must begin [right now, today] at the house of God" (I Pet. 4:17). God is now judging us — His Church. But what about the rest of this world's 4 1/2 billion inhabitants? They are not being judged now. Their time will come later. In the meantime, Satan holds full sway over their minds and hearts (Rom. 11:8). For more information, write for our free reprint, "Is This the Only Day of Salvation?" God has given the vast majority of mankind over to Satan to let him blind them at this time: "But if our gospel be hid, it is hid to them that are lost: In whom the god of this' world [Satan] hath blinded the minds of them which believe not, lest the light of the glorious gospel of Christ, who is the image of God, should shine unto them" (II Cor. 4:3-4). How does Satan deceive the masses — the whole world (Rev. 12:9)? He does it primarily through false religious organizations and false clergymen: "For such are false apostles, deceitful workers, transforming themselves into the apostles of Christ. And no marvel; for Satan himself is transformed into an angel of light. Therefore it is no great thing if his ministers also be transformed as the ministers of righteousness" (II Cor. 11:13-15). Just as Satan often quotes scripture (e.g., Matt. 4:6), so do his ministers, but they always either quote it out of context or put a clever but perverted twist on it: "For we are not as many," wrote Paul, "which corrupt the word of God: but as of sincerity" (II Cor. 2:17). Yes, God deliberately inspired the writing of the Bible in such a way that the worldly wise and the disobedient will misunderstand it and stumble over it. The apostle Peter admitted that some of Paul's writings were not easy to understand. He said that "our beloved brother Paul also according to the wisdom given unto him hath written unto you; As also in all his epistles... in which are some things hard to be understood, which they that are unlearned and unstable wrest, as they do also the other scriptures, unto their own destruction" (II Pet. 3:15-16). How, then, are we, the elect, to understand God's Word? Isaiah informs us of the attitude required: "But to this man will I look [says God], even to him that is poor and of a contrite spirit, and trembleth at my word" (Isa. 66:2). If we wish to truly understand the Bible, we must "Search the scriptures" (John 5:39) as did the open-minded Bereans (Acts 17:11 ). One must be careful about how he handles or expounds the Word of God. Paul told Timothy, "Study to shew thyself approved unto God, a workman that needeth not to be ashamed, rightly dividing the word of truth" (II Tim. 2:15). Many, instead of "rightly dividing the word of truth," corrupt God's Word and, as Peter said, wrest it to their own destruction. Just how was the Word of God inspired? Peter tells us: "We have also a more sure word of prophecy... Knowing this first, that no prophecy of the scripture is of any private interpretation. For the prophecy [in the scripture] came not in old time by the will of man: but holy men of God spake as they were moved by the Holy Ghost" (II Pet. 1:19-21). On some occasions when Old Testament prophets were inspired with a message, they themselves didn't even understand it. The prophet Daniel said: "And I heard, but I understood not: then said I, 0 my Lord, what shall be the end of these things? And he said, Go thy way, Daniel: for the words are closed up and sealed till the time of the end" (Dan. 12:8-9). Is the Word of God infallible, or does it contain discrepancies, contradictions and untruths? You may have heard someone say, "The Bible is full of contradictions!" or "You can prove anything by the Bible!" But are there any real errors in the Word of God? Let us examine some so-called biblical contradictions to prove the veracity of God's Word. One of the most striking examples of a copyist's error is found in II Chronicles 22:2, where we are told that Ahaziah was 42 years old when he began to rule. II Kings 8:26 says he was 22. Which is correct? None of the "original" documents extant solves the difficulty for us. Obviously a copyist's error was made thousands of years ago, and has been perpetuated to this day. How did this mistake come about? It is clear what happened. Though the Jewish copyists were extremely meticulous and copied previous manuscripts letter for letter, human error crept in. The Jews used letters to express numbers, and the ancient Hebrew letter for 40 was quite similar to that for 20 — so that one might easily be mistaken for the other.. But God has left us in no doubt as to which is the correct reading. Ahaziah was only 22, as mentioned in II Kings 8:26. The age given in II Chronicles 22:2 is incorrect. If Ahaziah was 42, he would have been two years older than his father, Jehoram, who was only 40 when he died (II Kings 8:17). God makes the truth plain for those who want to know if. But those who want to stumble or scoff certainly may. Notice another example: "Then was fulfilled that which was spoken by Jeremy the prophet, saying, And they took the thirty pieces of silver ... And gave them for the potter's field" (Matt. 27:9-10). A thorough study of the book of Jeremiah reveals no such prophecy. The prophet Zechariah did, however., write such a prophecy: "And the Lord said unto me, Cast it unto the potter: a goodly price that I was prised at of them. And I took the thirty pieces of silver, and cast them to the potter in the house of ' the Lord" (Zech. 11:13). Which of these prophets really gave this prophecy? Clearly, Zechariah wrote such a prophecy, but the Bible says it "was spoken by Jeremy the prophet." There is no contradiction here. Jeremy had spoken this prophecy, and Zechariah later wrote it down. Some think that the four accounts of what was written on Jesus' cross contradict. What was actually written on Christ's cross? Matthew's account says, "This is Jesus the king of the Jews" (Matt. 27:37). Mark: "The king of the Jews" (Mark 15:26). Luke: "This is the king of the Jews" (Luke 23:38). John: "Jesus of Nazareth the king of the Jews" (John 19:19). The Bible shows that "Pilate wrote a title, and put it on the cross.... and it was written in Hebrew, and Greek, and Latin" (John 19:19-20). The Bible does not say that anyone of the four titles was the only title written on the cross. Obviously, the answer to this supposed contradiction lies in the fact that the title on the cross was written in three languages. Each Gospel writer quoted from one of these, or else each combined portions of what was written in two of the three languages. There is no discrepancy. The Bible is not a science textbook. Nonetheless, whatever the Scriptures mention is always scientific. "It is he that sitteth upon the circle of the earth. and the inhabitants thereof are as grasshoppers" (Isa. 40:22). This verse clearly reveals that the earth is round, even though man did not "discover" this fact by himself until centuries after this was written. "He [God]... hangeth the earth upon nothing" (Job 26:7). The earth is held in orbit around the sun by the law of gravity. But it is not fastened to anything material. Notice the truth in this biblical statement: "Through faith we understand that the worlds were framed by the word of God, so that things which are seen [the physical universe] were not made of things which do appear" (Heb. 11:3). In plain language, this verse says that God created the physical, material, tangible world that we see out of invisible, intangible, nonphysical essence — out of spirit or spirit essence. Most scientists, steeped 'in evolution, are unwilling to admit the possibility that an intelligent, all-powerful Designer of the universe exists. But they are forced to agree that, as the Bible says, the physical universe came into existence from that which does not now appear (spirit). "According to modern physics, the universe began with a big bang, in which space and matter made a sudden explosive appearance — from literally nothing. There was a moment when all the material eventually used to create every star and galaxy could have been in the palm of an infinitely small hand" (The Economist. April 12, 1980). It is hard for humans to realize that, just as the Bible says, "In the beginning God created [brought into existence] the heaven and the earth" (Gen. 1:1). "Thus you can envisage how scientists see the big bang as the sudden, explosive appearance of both space and matter from literally nothing" (ibid.). Of course, God most certainly did not use a "big bang" to create the universe. But the more research scientists perform, the more they are forced to admit that what the Bible says is true. The Bible is true not only scientifically, but historically. Again, though the Bible is not a history book, whatever is mentioned as history in the Bible is always true. For example, a few decades ago, skeptics doubted the very existence of ancient cities such as Nineveh and Sodom. But archaeologists have uncovered abundant testimony to prove that those ancient cities actually existed, just as the Bible said thousands of years ago. Is the Word of God infallible? It certainly is. Christ said, "Heaven and earth shall pass away, but my words shall not pass away" (Matt. 24:35). Through the centuries, many have tried — unsuccessfully — to discredit or destroy the Bible, "But the word of the Lord endureth for ever" (I Pet. 1:25). Just how important is the Word of God — the Bible — in God's eyes? We know that God is very concerned about magnifying and protecting His name: "Thou shalt not take the name of the Lord thy God in vain: for the Lord will not hold him guiltless that taketh his name in vain" (Ex. 20:7). But God is even more jealous concerning His Word than He is His own name! "For thou [God] hast magnified thy word above all thy name" (Ps. 138:2). Of what real value is this Word of God? Why has God given it to men? David said, "Thy word is a lamp unto my feet, and a light unto my path" (Ps. 119:105). Without that brilliant lamp, this world would be in total darkness. It is only through the light of God's infallible Word that man can ever come to know who he is, where he came from, what is his ultimate destiny and how he is to attain that incredible potential. Let us all thank the great God for the precious gift of His infallible Word!